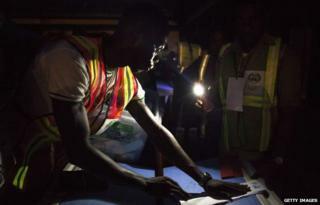 International observers have hailed Nigeria's elections, despite technical hitches, protests and reports of violence. UN Secretary General Ban Ki-moon said in a statement voting had been "largely peaceful and orderly". Voting continued for a second day in some parts of Nigeria after problems with new electronic card readers. It is expected to be a closely fought battle between President Goodluck Jonathan and Muhammadu Buhari. Thousands of opposition supporters in Rivers State have protested against alleged killings of campaigners and voting irregularities. Nigeria's election commission said its office there had been set on fire and it was investigating the complaints. Mr Ban praised the "determination and resilience" of Nigerian voters, despite reports of attacks by Boko Haram militants and others. He urged voters to maintain a "peaceful atmosphere and to exercise patience" throughout the process. His comments were echoed by John Kufuor, the head of the regional bloc Ecowas, who said the process has been "quite peaceful, orderly and credible". The election as it happened. Mr Jonathan and at least three governors from his ruling party were among those whose biometric details could not be checked by the electronic card readers - new technology intended to reduce fraud. Instead, they had to be processed by hand. Mr Jonathan's Peoples Democratic Party (PDP) called it a "huge national embarrassment" and a "vindication" of its position against the technology. "There should have been a test-run for a smaller election before deploying it for an election of this magnitude," said Mr Jonathan's presidential campaign spokesman Femi Fani-Kayode. About 300 polling units out of 150,000 were affected, a spokesman for the Independent National Electoral Commission (Inec) said. The vote had been delayed by six weeks because of the insurgency by militants from the Islamist group, Boko Haram. Both the main candidates had pledged to prevent violence during and in the aftermath of the elections. But several hours after voting started, reports came in of attacks at polling stations. Mr Jonathan told the BBC's Peter Okwoche that most of the violence there was not related to the elections. "The war against terrorists is going on, voting or no voting," he said. "There was a conflict, kind of a crossfire, between soldiers and terrorists that had nothing to do with the elections." Voters are also electing members of the house of representatives and the senate. Initial results could come as early as Sunday evening.